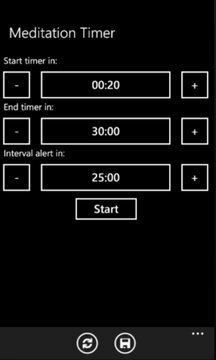 This is a simple meditation timer. 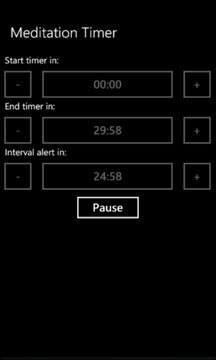 The timer has 3 controls: delay before it starts measuring time, total duration of the meditation, intermittent intervals timing. The times can be adjusted by tapping the plus [+] and [-] buttons. The delay time is adjusted with 1s at a time, total duration and interval – at 1 min step. The set times can be stored by tapping on icon on the application bar. When the desired durations are set tap on button to start the clock. The beginning and the end are indicated with 3 tingsha chimes. The intermittent intervals are indicated with single tingsha chime. The meditation counting can be paused with [Pause] and resumed later with [Resume] button or reset to stored settings with icon.